Being stung by a bee, wasp or hornet is a very painful and scary event, but in most cases does not cause more serious complications. A bee sting is uncomfortable and painful, but does not progress beyond that. The exception occurs in patients who are allergic to the venom from Hymenoptera, the order that includes the families of bees and wasps. Before we talk of stinging bees, it is worth a quick review of the bees and wasps biology. This part is very brief and simplified, do not be alarmed. The order Hymenoptera is one of the largest groups among the insects, encompassing the various families of bees, wasps and ants. Just to give you an idea, there are more than 10,000 species of bees and more than 25,000 species of wasps. For example, the carpenter bee is a species of large bee, which has darkened and body like a beetle. Already wasp is the name given to the largest species of wasps, usually with the body color more darkened. Of course, let's not waste time discussing the biological and geographical differences of each species of Hymenoptera order, because it is irrelevant to the purpose of this article. Most species of bees and wasps are docile animals that usually do not sting humans unless they feel attacked. Have a bee around is not dangerous, unless you try to hit it or accidentally crush against your skin. Bees do not usually attack without reason. In general, bees and wasps distant from their hives not exhibit aggressive behavior and offer little danger to humans. And even near their hives, most bees are not aggressive. There are, however, exceptions. A few species, such as African bees are very sensitive and can attack humans if they feel that their presence threatens their hive. Noises and sudden movements can irritate them and cause attacks of several bees at the same time. In practice, most bee stings and wasp occurs in isolation by a single insect, usually a worker bee is away from its colony. Pitting occurs when the insect inserts its stinger in the skin as a defense to feel attacked. Wasps and bees that sting are always females, because males do not have stingers. There are two patterns of use of the stinger: some species such as the common bees, suffer self-amputation, that is, when they attack, they lose their sting and part of the abdominal structures, which leads to death. There are species, but which do not suffer from self-amputation and can sting the same victim more than once. The amount of venom injected is usually higher in species that lose their sting. After the sting, the patient feels intense pain and a little inflammation of the affected region. The location is stung reddened and swollen. The lesion tends to be between 1.0 and 5.0 cm in diameter and will disappear after a few hours. In most cases, the pain and swelling disappeared in no more than one or two days. In 10% of cases the patient develops a greater reaction to the bites, with severe pain and swelling that can reach 10 cm in diameter and take up to 10 days to disappear. This type of reaction does not mean that the patient is allergic to bee venom. The isolated chopped usually do not cause major problems in most cases. However, in the case of multiple stings by bees several at the same time, the amount of venom injected may be large, leading to symptoms such as diarrhea, vomiting, headache, fever, prostration and mental confusion. To be risk of death are usually takes hundreds stings so there inoculation lethal amounts of venom. In these cases, the complications can arise poison action, such as hemolysis (destruction of blood cells), cardiac arrhythmias, renal failure and rhabdomyolysis (breakdown of muscle cells). The great danger of bee stings and wasps is allergic reaction, called anaphylaxis or anaphylactic shock. 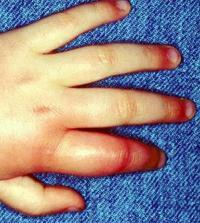 Anaphylaxis can occur after a single bee sting. About 3% of the population is allergic to the venom of bees and can develop anaphylactic reactions after sting. The serious signs of allergic reaction to the sting of bees or wasps emerge quickly after the sting, usually in just 5 minutes. Allergic reaction symptoms are hives, angioedema (swelling of lips and eyes), hypotension, vomiting, hoarseness, difficulty breathing, disorientation and loss of consciousness. Anaphylaxis usually occurs after a second bee sting in people who have developed allergic reactions when first bitten. 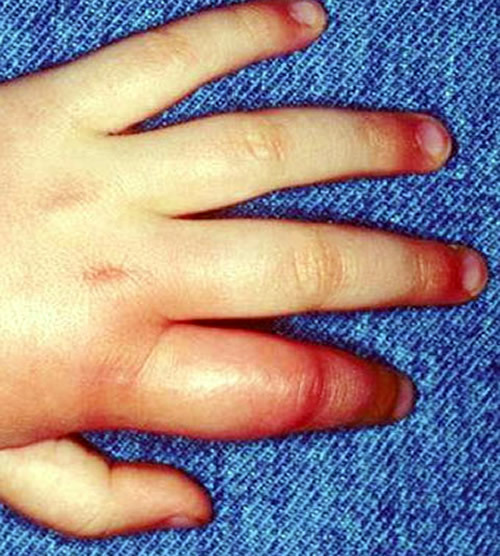 However, anaphylactic shock can arise even in those who had never been stung by bees before. If you have been stung by bee or wasp and developed symptoms that were beyond a simple local swelling, especially if you have had angioedema urticaria or asthma attacks, look for a imunoalergista doctor to investigate the possibility of you being allergic to bee sting. The risk of anaphylactic reaction in a second bite is very high. In the case of bees and wasps suffering self-amputation, the first act of the patient should be the immediate removal of skin stinger as it remains injecting poison still for 1 or 2 minutes. Some authors show that one should be careful not to squeeze the small pouch that comes with the sting, because it is what contains the poison. The stinger can be removed by scraping the nail on the skin or any hard object such as a knife or credit card. Studies, however, who say that the form of withdrawal of the stinger little influence in instilling the poison, as the contraction of the bag does not increase the volume to be injected, as this is done by valve mechanism. So if you do not get it removed immediately by scraping it, the stinger should be removed anyway, for the time he is stuck in the skin is much more harmful in terms of poison injected volume than the way it it is removed. Even if you can not remove the stinger immediately, in time to prevent the entry of all the poison, it should be removed as soon as possible, because their mere presence can cause inflammation of the skin. Once removed the sting, the treatment of bee sting is simple. Wash skin with soap and water and apply cold compresses or ice spot. If the pain is bothering you, a simple painkiller can be used. If there is severe itching, an antihistamine to help relieve it. No need to spend ointments or other substances such as toothpaste, coffee grounds, butter, etc. None of this improvement and may cause wound infection. Pain and swelling of the sting disappear spontaneously after a few hours. In the case of more intense local reaction, corticosteroid-based ointments and / or corticosteroid orally as prednisone, may be prescribed to relieve swelling. Anti-inflammatories and antihistamines are also useful. If the bite injury is getting worse over the first one or two days, seek medical help. In cases of allergic reaction, mainly characterized by hives or angioedema appearance, the patient should be taken as soon as possible to an emergency service. In case of anaphylaxis, the treatment is done with intramuscular injection of adrenaline.